I’ve had a few issues with Facebook in the past, both ethical and personal. The whole Cambridge Analytica issue has left me with a deep distrust of the way Facebook manages itself. I’ve also been in situations where civility in small communities has suffered because of people randomly posting their thoughts about others in their broader social circle. However… I’ve decided to give it another go, if just for The Kingdom Of Plants. I do recognise that Facebook, when used mindfully, is a great way to connect with others who share similar interests. Hopefully it will allow me to connect people around the world who have an interest in plants. Fingers crossed… The Kingdom Of Plants Facebook Page. Reading: Wundersmith, by Jessica Townsend. Watching: The Crown, Season One (again). Listening: The Crimes Of Grindelwald OST, by James Newton-Howard. I had the wonderful fortune to visit Tasmania over the Christmas/New Year. Living in such a hot, dry environment for most of the year, Tasmania’s temperate, maritime environment was such a bracing (and welcome change). 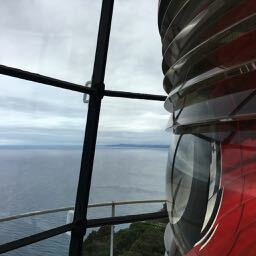 Apart from watching my kids seeing snow for the first time and the incredible diversity of plants and untouched wild-spaces on offer, the highlight for me was getting up close to a Fresnel lens at the top of a lighthouse. One of the first images I had for The Kingdom of Plants revolved around the idea of a lighthouse as a portal to another world. I didn’t even know what that world would be, but I knew that the lighthouse was the key to getting there. The Fresnel design has fascinated me for over 20 years, ever since I took a high school workshop on lighting and sound for stage performances. But it is the massive lenses (this is a second order lens) fixed atop of spiral staircases and shining their light over vast oceans that have truly captured my imagination. I feel blessed to have finally been able to tick this experience off my bucket list.